Tyan has long been known to be working on a dual AMD solution. The Thunder K7 (Model No. S2462) as this mysterious board is known is expected to be released sometime in early quarter two of this year. According to a recent announcement on Akiba, a Japanese computer information magazine, the Thunder K7 is estimated to enter the retail market for around 118,000 Yen, or about $950 USD. While that may seem like quite a hefty price tag, the revolutionary motherboard is targeted at the high-end workstation and the server market, and not the consumer market. Regardless, what you get for your money is impressive: The Thunder K7 is build-up from an astounding 8-layer PCB and is based on the AMD 760MP chipset which supports 200MHz / 266MHz FSB. The board has two socket 462 ZIF slots, one 4X AGP Pro slot, five 64/32 bit - 33MHz 6 volt PCI slots and four 184-pin DDR RAM slots for up to 4GB of PC1600/PC2100 compliant memory. Tyan's S2462 Dual AMD motherboard had dual channel master mode supporting upto four IDE devices with DMA 100/66/33. An Integrated LAN option gives the board two 3Com 3C920 Lan Controllers for 10/100Mbps support per controller. Integrated SCSI capabilities comes from an Adaptec AIC-7899W controller which yeilds two 160M SCSI channels for support of upto 15 LVD devices per channel. Other ports include; one floppy, one serial, one parallel, four USB and PS/2 for keyboard and mouse. 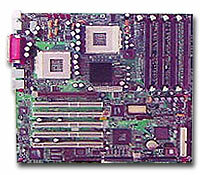 Graphics come from an integrated ATI RAGE XL graphics accelerator with a 4MB SDRAM frame buffer. Aside from the AMD 760MP chipset, the dual AMD Thunder K7 incorporates an IDG-2 North Bridge and Viper South Bridge along with a Winbond W83827HF Super I/O ASIC. The BIOS on the Thunder K7 is by Phoenix. The 2MB flash BIOS has one interesting feature which allows for multiple boot configurations. Hardware monitors include three fan headers, 2 intrusion detector headers, and processor temperature and voltage monitoring. Power comes to the Extended-ATX board via 24-pin and 6-pin power connectors. The S2462 is a large board and measures about 12" x 13". While these are still just the preliminary specifications, they will no doubt generate a lot of interest in Tyan over the next few months before the dual AMD motherboard is officially released. Join Now to be one of the first to get the exclusive scoop on Tyan's Dual AMD motherboard when it launches! Also read about secret reviews, enter into newsletter-only contests and get your dose of hardware gossip straight from our best tech spies!